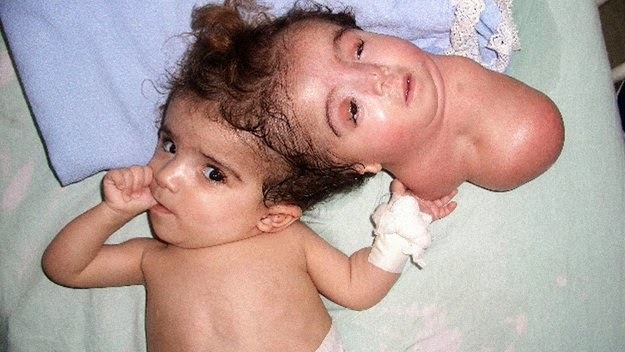 An Egyptian girl, Manar Maged, was born with the rarest forms of birth defects called craniopagus parasiticus that occurs when an embryo splits in the womb but does not develop fully into a twin. Her second head contained eyes, a nose and a mouth, but was not connected to any internal organs and It could smile and blink. Manar was operated by a team of thirteen surgeons on 19 February 2005 when she was ten months old to separate her conjoined twin. The procedure being complex and ambiguous the surgery lasted thirteen long hours. Though she survived the surgery and the subsequent brain operations, she died year later on 25 March 2006 due to excessive brain infection, pneumonia and serious heart condition.